We have often demonstrated how what is going on in the world of fashion sets the tone for our interiors. As a rule we are not even aware ourselves that we go for the same fabrics, styles and textures in our living environment as we do for our wardrobe. With The Linen Collection Arte once again demonstrates the strong link between the two branches.And how beautiful materials – such as linen – are really shown off to their advantage in contemporary interiors. Linen is a great natural product with very modest origins. It is made from flax, a plain, nondescript plant which only flowers for a very short period. Linen production is a labour intensive process, but the end product has unsurpassed properties. Linen is strong and hard-wearing, it retains its shape and is shrink- proof. It has a soft feel, is light and comfortable to wear as well as being non-allergenic. Linen is also environmentally friendly due to the fact that it can be recycled and is biodegradable.And – you may well consider this a drawback – linen creases easily. But that is precisely the property which Arte has decided to concentrate upon. In The Linen Collection you will undoubtedly recognise the typical linen appearance. 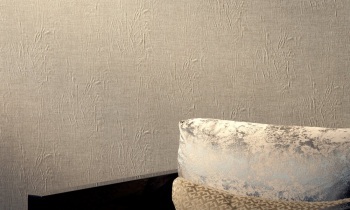 But beware, this is no imitation.This wallcovering is actually made of 100% pure linen! At Arte the designers have worked like crazy in order to develop a technique which makes it easier to furnish your interior with this wonderful fabric. MagnificentThe material is consciously and intentionally folded and embossed, and as if it weren’t already beautiful enough, a metallic sheen is then added. In this way the linen is really shown off to best advantage.You don’t just have the character of the fabric, but also its tactile nature and the relief of the folds, with this soft gleaming glow.Truly magnificent. There are three variants in this collection. Radiant, a pleated stripe with metallic sheen in the colour combinations ecru and silver, beige with gold, a sort of khaki with a golden sheen and black with copper. 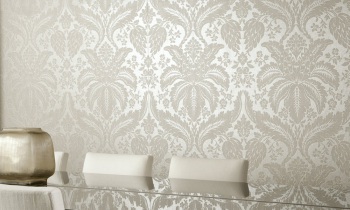 Slightly more classic perhaps is Damaslin, (the name is a fusion of damask and lin, French for linen). A basis of smooth, ironed out linen upon which an elegant and supple damask pattern is portrayed. Damaslin is available in ecru with silver, beige with gold and black with copper, but also in shades of grey, both with gold and with silver. Here too that amazing effect is recreated, playing on mat and gloss, depth and relief, while you actually thought that you only had one colour in front of your eyes.And last but not least Lino has the same colour palette as Damaslin. Classy! According to a Japanese proverb “Modesty is a sign of greatness”.Well, once you have seen this collection, you can only agree.